Despite wrapping up in a clumsy excess of ambition, Lemma is a thrilling experimental expression of the free-running genre. What is it? 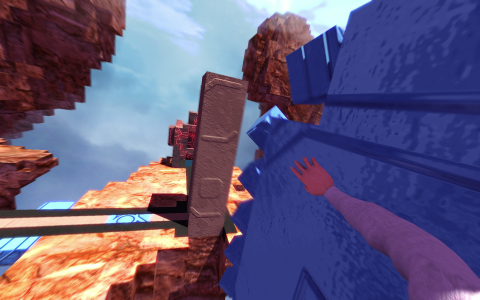 A first person parkour puzzler. More than once, Lemma inverted my guts—I nearly fell out of my chair a couple times. Its first-person free-running punched me right in the adrenal gland, and it’s been a long time since a game has elicited as many strong physical reactions. The last time a game made me feel this way was, big surprise, Mirror’s Edge. Despite looking and feeling very similar, Lemma isn’t just a cheap emulation. It takes the free-running that made Mirror’s Edge so beloved, and literally builds on it by giving you the ability to create surfaces wherever you roll, slide, or wall run. It’s thrilling—I was able to map out and create paths out of thin air on instinct, bouncing between walls and leaping off impromptu platforms. Later on, obscure puzzles and open environments had me wanting to hit Alt+F4 more than the jump key, but the first three hours had me shouting “Wee!” with reckless abandon. That was an awkward conversation with the housemates. Every facet of Lemma’s design asked me to construct something cohesive from a series of building blocks, in the figurative and literal sense. At its simplest, the primary objective of each level in Lemma is to get from point A to point B, solving puzzles along the way. You navigate environments by running, jumping, and building via sliding or wall-running. To build, you have to start your slide or wall run on a solid surface, and when the surface ends, one will materialize out of cubes beside or below you. What exactly the the majority of the puzzles entail and how to use your abilities to solve them is part of Lemma’s charm and best left unspoiled. A basic puzzle required me to start a wall-run on a power conduit towards another across a long gap. As I ran, a wall materialized beside me in flurry of cubes, eventually connecting the two conduits and completing a circuit that powered moving platforms, and allowed me to progress. The sense of discovery when figuring out how different surfaces or symbols relate was my favorite part of the game. There’s a language of sorts at play, and mastering the language and the parkour leads to stirring improvisational moments. You’re given plenty of leeway to do so since dying has almost no penalty. Fall to your death and you’re instantly sent back to where you last touched off, all of your creations intact. Nearly everything but the player character in Lemma is made of cubes. The environments look like a surrealist interpretation of Minecraft—fragments of land splattered across every horizon, each level an array of colors and light that create a dreamlike look. I often looked for high ground, just to soak in all the gorgeous vistas. And when the sparse, evocative soundtrack accompanied these moments, I was genuinely moved. Standing around wasn’t always an option, though—sometimes the ground would give way without warning. Certain enemies and anomalies are able to destroy the environment over time, and since damage done and paths built are persistent, some levels looked completely different by the time I made it through. I felt a sense of authorship looking back on the path I blazed through an environment, but when I was forced to traverse the same route time and time again adding blocks as I went, it got crowded and messy. The intentionally fragmented aesthetic plays into Lemma’s light narrative. You’re able to find notes hidden throughout each level that often lead to more questions than answers, but the bread crumbs remain interesting enough to pull you forward. I was never compelled to unravel every narrative thread, and when the story stepped into the foreground in the last third of the game, I was pretty lost, but not dismayed. The broad strokes were clear enough to convince me I wasn’t just playing a thoughtless running simulator. Multiple playthroughs will no doubt yield a clearer understanding, but it’s not necessary to know exactly what’s going on to enjoy the game. I often looked for high ground, just to soak in all the gorgeous vistas. But Lemma leaps too far into its fragmentary design near the latter third. I was given some new abilities, goals, and puzzle ‘language’ components, which I found exciting at first. The game kept giving me more, surprising me often, but the linear environments gave way to large, open, connected levels, which made figuring out the new abilities and puzzles much more difficult. After hours of smooth sailing, I fumbled around these open levels like I fumble through most physical of space. The linear levels gave me prescribed grounds in which to experiment and navigate. The open environments had me bouncing between them without aim—experimentation gave way to frustration after dying repeatedly, retreading ground, and stumbling into solutions. I was denied the invigoration of discovery and instead felt like a blockhead when I ‘figured’ anything out. Worst of all, those harrowing leaps? Nail-biting ledge grabs? I stopped feeling much after rolling through the same obstacles for the thirtieth time. Started drinking, hanging with a rough crowd. It’s a shame Lemma stumbles for the last two hours or so, especially when taking into account it was the product of a single developer. It has the locomotive quality to give any free-runner game a free-run for its money—it just ended on such a sharp note. Believe it or not, I survived this. Moods shift quickly in Lemma.